Sweeteners, and indeed all foods, can be considered to have a place on a different but related continuum called the Glycemic Index, or GI -- something that diabetics know extremely well, but that describes the healthy relationship between eating and digestion. The GI measures the effects of carbohydrates on blood sugar levels. Carbohydrates that break down quickly during digestion and release glucose rapidly into the bloodstream, like baked potatoes, watermelon, white bread, most white rices, corn flakes, extruded breakfast cereals, and glucose have a high GI. Carbohydrates that require your digestion to work to release glucose into the bloodstream, like most fruits and vegetables, nuts, brown rice, and fructose have a low GI. Sucrose -- white sugar -- falls in the middle. Several lines of recent scientific evidence have shown that individuals who followed a low-GI diet over many years were at a significantly lower risk for developing both type 2 diabetes and coronary heart disease than others. ��� I often get questions about Xylitol, Stevia, and other products marketed as 'natural sweeteners.' These are derived from leaves, stems, fruits and vegetables, corn husks, grains, and even mushrooms. The sweeteners are extracted, usually with heat and chemical solvents, and are about as far away from raw foods as it's possible to get. (See my February 2011 newsletter for a discussion about the use of 'natural' on labels.) For some folks with special dietary needs, these products are gifts. Personally, I'm not convinced that these products are safe. Honestly, when it comes to eating something with a name that begins with the letter "X" I like to apply Michael Pollan's principle: Don't eat anything your grandmother wouldn't recognize�as�food. Here's an example: Let's talk about sweeteners. We can save the discussion of Enlightened Label Reading and subversive added sugars in packaged foods for another newsletter. Right now, let's consider our simple, everyday sweetener choices. These are about as low-hanging as I can imagine. Take sugar: The white refined stuff we all grew up with is on the "most processed" side of the sweetness continuum, only a little less artificial than the chemical sweeteners like cyclamates and saccharin, which are suspected carcinogens ... Please tell me you are no longer using the stuff, right? Just a little way along the sweetener continuum, we find evaporated cane, palm and coconut sugars -- all pretty close to white refined sugar, with all the good "brown stuff", the molasses, removed. Next up, we have some liquid sweeteners -- agave (watch out for conflicting and deceptive claims here; not all agave syrup is created equal -- be sure to use a trusted brand) and yacon syrup. Next there are the nearly natural sweeteners, maple syrup and honey. Finally, at the natural end of the spectrum, we find the whole plant food sweeteners: dates, raisins, and other dried fruits. Now let's apply the "low hanging fruit" idea to the sweetness continuum. Can you replace a sweetener with another that's less processed and lower on the Glycemic Index (see the sidebar), and therefore healthier? One of our most fundamental principles is that less processed foods are better for us. So here's my question: where do you use sweeteners most? Morning tea or coffee? Baked goods? Desserts? Have you tried using less refined cane sugars? Take a deep breath, and move on up to maple syrup or honey. Yes, it changes the taste, and that can rub harshly against old habit. Remember, we're working to change habits gradually, patiently. Stop when you feel a little uncomfortable, and let your new choice settle into your routine. If one sweetener doesn't work, try another, but always keep moving toward healthier choices. Substituting a syrup for a powder can also change the texture. In baking, sugar is considered among the liquid ingredients, but a little experimentation is always in order. You'll notice that my green smoothie recipes suggest using dates or ripe fruits (bananas) for sweetness. Many fruits can be deliciously sweet, especially if you get them fresh and at the height of ripeness. Over time, as you use fruits to sweeten your green smoothie, you'll notice they begin to taste too sweet. That's your taste buds recalibrating, and signalling that it's time to cut back on the sweetening fruits. You're moving right along to a more balanced whole plant food diet, fully charged with more greens -- my favorite colors! and finally, home-made nut milks. These are the only ones that are reliably raw, and made with ingredients and processes that you KNOW are healthy. The More than a NUT MILK BAG makes it easy to make fresh nutrient packed almond milk without the preservatives found in the boxed commercial ones available. Many of us know that the all-at-once reformation plan, the extreme diet, and any plan that makes too many changes at once, is almost impossible to sustain. Chances are we won't be able to stick to it, and when go back to our former lifestyle, whatever we were trying to change -- weight, cholesterol, stress -- will come roaring back. Let's stop the madness. Healthy lifestyle changes are imperative. Each of us is 'our own best doctor.' Prescribe those necessary changes one mouthful at time ...and stick to the prescription! The marketing, medical and conventional farming and agricultural businesses don't want you to succeed. We need to get past their hype, get ourselves Organic and buying locally produced, minimally processed foods. Take a chance with a new organic vegetable you've never seen before. Develop a friendship with the produce grocer in your local store and ask questions. Buy a tasty looking new ingredient and look it up on the web -- I'm always surprised by how many good ideas are out there free for the taking. Attend a cooking class or healthy lifestyle lecture close to home. Take what you like, ignore what you know you can't make work, thank the 'talking head' for sharing, and go home and think about what you've heard. 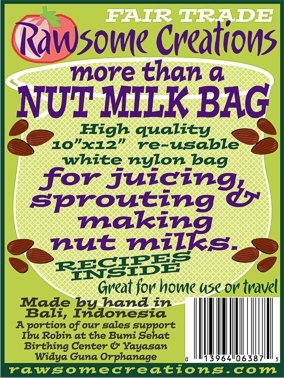 Try one thing new and different each day - maybe it's a smoothie, making your own nut or seed milk. Try a homemade salad dressing instead of a store-bought bottled one. Just grab a piece of fruit in the afternoon for that snack when your blood sugar begins to drop.